Ideas matter, obviously, and the piece attempts to re-contextualize many ideological struggles which keep shaping our day-to-day lives (I have it on good intel that the guys down at the docks say ‘quotidian struggles’). I don’t know all the reasons, but there’s definitely an Anglophilia at work, our division by a common language, and perhaps an overall ideological predilection towards an Anglo-sphere alliance. I think there is mutual benefit, security and leverage to be had in working for a more closely united English-speaking ‘liberal’ world order. There are many sacrifices and risks, dangers and blind-spots, too. Many of these writers/thinkers have had to face a more institutional and entrenched Left. They can know intimately whereof they speak. 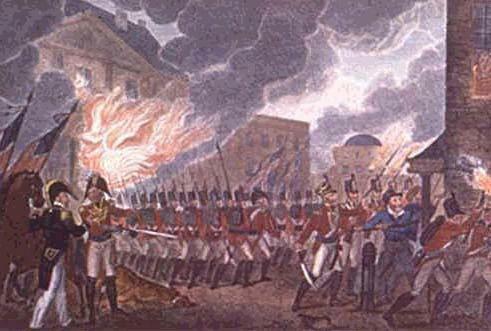 This is a depiction (thanks to impiousdigest.com) of British troops burning the White House.